Welcome to this beautifully decorated 2 story end unit townhouse in the premier community of Sea Colony. It is in walking distance to the beach (450 steps/ 1/4 mile), fitness center & world class tennis center as well as the Marketplace of Sea Colony. It has 2 bedrooms (1st floor master suite & 2nd floor loft suite, both having attached bathrooms and walk-out on to decks)) and 2 bathrooms. Master bedroom is on the first floor w/ connecting bathroom which has just been remodeled w/ tile floors, all new fixtures and a vessel sink, all sparkly clean. The master bedroom also has a walk-in closet, its own TV and plenty of dresser drawer space. There is a rocker and a sliding glass door that leads to the first floor deck. The first floor also has a convenient entry way w/ plenty of places to hang your shopping bags, personal belongings or beach cover-ups. This opens to the cheery and comfortable living room w/ comfy naugahyde-covered loveseat and sofa. TV armoire houses plenty of board games & cable TV & VCR. Internet is available with a cable modem for high speed internet access. From the living room, walk into the dining room which seats 6. Nice tablesettings available for every meal. Along dining room is a bar that looks into kitchen and seats 3 on barstools. Open kitchen allows for you to be a part of living or dining room action or TV viewing. Kitchen has new dishwasher & refrigerator with older microwave & oven. It is a well stocked & nicely decorated kitchen w/ bagel size toaster, blender, coffee maker, crock pot & electric can opener. There is a 280 sq ft deck on the first floor waiting for you to put your fit up or to enjoy a meal out on the deck grilled in the charcoal grill provided for you. Prior to entry to the first floor deck, there is an outside private shower which also has an attached storage area. This storage area has shelving which holds the beach chairs, beach toys and boogie boards which all may be used by our guests. Also theres is a hose in this shower area. staircase is a large 300 sq ft 2nd bedroom loft w/ curtained half wall. This area has a total of 4 twin beds (two twin beds next to each other and then a daybed on the side w/ a twin size trundle underneath it). Off the bedroom is a large deck w/ chairs and hammock ready for you to rest & relax. The upstairs bathroom was remodeled Spring 2011 and has all new fixtures and tile floor. The sink area is separate from the toilet & tub/shower area by connecting door. This allows for multi-use. Also there is a large walk-in closet which can house suitcases. There is a small TV in this bedroom w/ a DVD player situated on a small table with comfortable chairs. Nice area for kids to put together puzzles or read a book. Back downstairs, before entrance into the bathroom, there is a laundry area behind a set of bi-fold doors. The washer and dryer are full size along with a drying rack. This unit has easy access to beach (by crossing over Coastal Highway via crosswalks), pool & tennis courts and neighbors the Marketplace at Sea Colony which has 3 restaurants,gift shops, candy shop, beach good store and bike rentals. Delaware Seashore State Park is just to the north and Fenwick Island State Park is a 5 minute car ride away. Twenty minutes north is Dewey & Rehoboth Beach which offers great shopping (tons of outlet stores and quaint one-of-a-kind shops) & restaurants. Ten to twenty minutes South is Fenwick Island & Ocean City Maryland which also has lots of shopping and a great night life as well. Less than 3 hours by car from Baltimore, DC & Philadelphia areas. Prior to remodeling the unit for the rental season, our family spent delightful summers at Sea Colony. You will love this place as it has so much to offer and gives you a small town feel. It is a wonderful place with.... tennis, the beach, fitness center, biking, pools, good food at local restaurants, & southern hospitality. You will find it all here. Our condo is in an excellent location as you can walk to the fitness center, tennis and the beach as it is centrally located. We are only 450 steps from the Atlantic Ocean. Or if you prefer, you can take the shuttle. Without a doubt, we know you will love all that Sea Colony and our lovely condo has to offer. I enjoy walks on the beach and it is easy to walk all the way to the boardwalk in Bethany. Also I enjoy the classes at the fitness center which are available for a small fee. Most of all the tennis facility is wonderful. We are fortunate to have two top ranked tennis clubs in the area. The other is at Dave Marshall Tennis & Fitness Center in Lewes, DE. 302 645-0616 or 302 645-0713. Although it is a 30 minute drive, the instruction is worth it and then you can take a visit to the town of Lewes (go to Agave for lunch or dinner-awesome fresh Southwest cuisine or the Buttery- American cuisine) or go to the outlets in Rehoboth. We still live in the area (7 miles away) so feel free to call w/ any questions or concerns. (302) 344-1692. We chose this property because of the great layout and its location. The property offers two private 280 sq. ft. decks, one on the first floor and one on the second floor, with lots of comfy furniture. The condo was decorated with TLC with hopes to encourage tranquility, relaxation and peace. We hope you have a restful vacation here. We have beach chairs and beach/pool toys ready for your use. The bathrooms were remodeled in 2011. New carpeting in 2018. This Sea Colony unit is only 3/10ths of a mile from the beach in Bethany. The resort has indoor and outdoor swimming pools, saunas, whirlpools (indoor & out), indoor and outdoor tennis courts (Har-tru & hard), bike and walking trails, basketball courts, shuttle service etc. Older unit but works great, located above stove. It is fully stocked and ready for your use. Please call if there is something specific you want or need and owner will try to have for you. 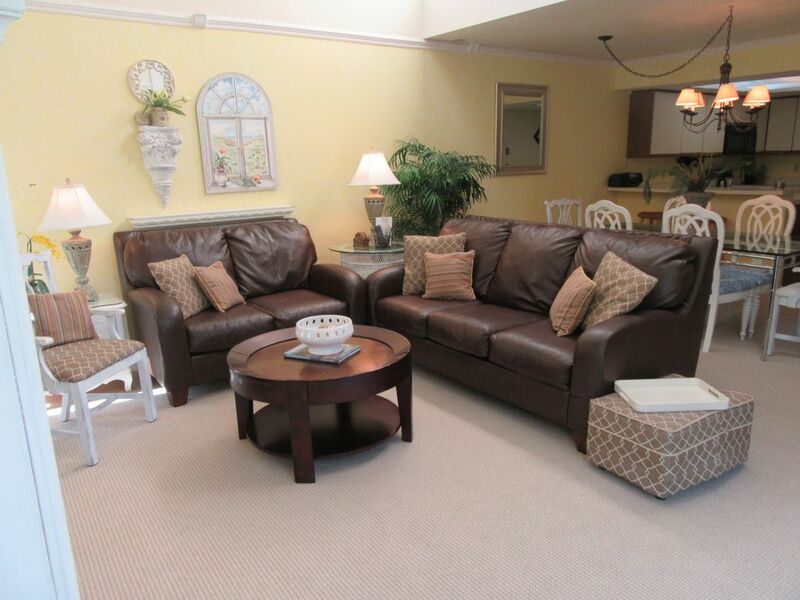 Two spacious decks w/ relaxing furniture on each floor directly off bedrooms. First floor deck is also part of entryway and has a gate to keep area private. Each deck approx. 280 sq ft. There are 2 indoor pools on grounds and several outdoor pools including 2 at the beach and one in short walking distance from condo. All have lifeguards. Our recent, last-minute, mini-vacation at Lori Marshall’s house in Sea Colony was a wonderful experience. The house is beautifully decorated, clean, bright and welcoming. The owners have thoughtfully provided everything needed. We have visited Sea Colony almost yearly for the past 25 years and everyone in the family agreed this was one of our favorite units. Dealing with Lori was also a pleasure. She was very pleasant, accommodating and readily available for any questions. We’re already planning our vacation there for next Summer. We highly recommend! All it claims to be and more! We were scheduled to arrive the weekend that Florence was to hit land. Since we didn't want to take a chance on it being further north than predicted, we contacted Lori and she immediately gave us other dates that the apartment was available. When we arrived it was immaculate, orderly and wonderfully furnished. The location was ideal for us-a short drive to the beach, convenient to Bethany Beach, and near the outlets in Rehoboth. My sister enjoyed choosing which of the 4 twin beds she would use and having the upstairs bathroom and deck to herself. We would love to return again! Lori even offered us a late check-out because no one else was scheduled to be there right away. Lori was terrific to work with! Will not rent here again due to insurance claim from pre-existing damage. We took my mother here for her 70th birthday. Initially everything was fine until we noticed that there was a throw blanket covering the right seat cushion of the couch, when we removed the throw there was a large tear in the sofa. We also noticed that there were several other pre-existing rips and tears on the other cushions that had been glued together. Clearly this couch was old and well used. When I addressed this with the owner so this wouldn’t fall on me, she admitted that it was from the previous renter. I thought everything was fine until a month later a claim was filed against me with the insurance company for her to be able to purchase a new couch. This truly sad as I would have liked to rent here again, but I am not willing to take the risk of pre-existing damage becoming my liability. Condo is just a short walk to the beach. Clean, comfortable. Lori's condo was comfortable and she was easy to communicate with from the start. We were two adult couples who needed a place at the beach for two nights so, given how few weekend rentals seem to be available, this worked very well for us. The kitchen is pretty well stocked and the bedroom configuration made for privacy. It probably should be noted clearly and up front in the HomeAway listing that starting in June each year, each person staying at a Sea Colony rental has to pay a 40 dollar resort fee. We knew there would be a fee involved but had not been told that we'd be adding a full160 dollars on to the cost of our 48 hour rental. As it happens, we never used the "facilities." The unit is approx. 200 feet from the Marketplace at Sea Colony which has many eateries including a pizza parlor/Italian food restaurant, a seafood restaurant, a place with pub-like food, candy store, ice cream shop and a bicycle rental place. It is approx. 1/4 mile from the beach which has cross walks to keep the walk safe and easy. A rental agreement provided by the owner is to be signed by both parties. The rental agreement is sent to renters via e-mail after renter provides address, home and cell phone numbers and drivers license and state issued.